A Palamedes swallowtail butterfly (Papilio palamedes) inserts its long proboscis into the equally long nectar tube of an orange-fringed orchid (Platanthera ciliaris). Photo by Adam Chupp. Plant reproduction is often limited by the availability of pollinators, which are themselves dependent on larval host plants. 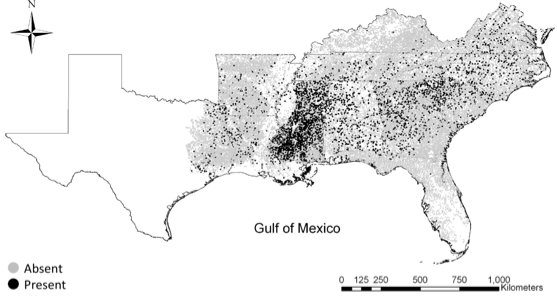 The Palamedes swallowtail butterfly is abundant in the southeastern USA but is in decline due to the widespread mortality of its primary larval host plant, which has been attributed to laurel wilt disease. 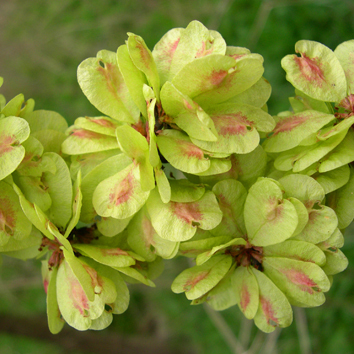 A new study published in AoB PLANTS by Chupp et al. 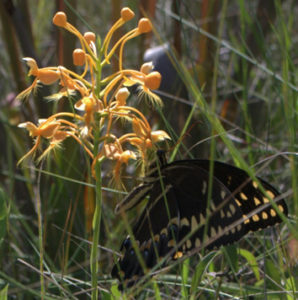 suggests that the orange-fringed orchid relies heavily on this butterfly for pollination and that availability of alternative pollinators is low. The authors conclude that populations of this and similar orchid species are indirectly threatened by an exotic plant pathogen that kills the primary larval host of the Palamedes swallowtail.